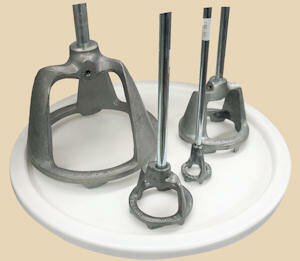 For many years we carried Jiffy Mixers as an industry standard. We've switched over to Hanson mixers because we like the radical toothed design that works fast and with a minimum of trapped air. The cleat-like teeth do a great job of digging, chewing up and mixing the solid materials that settle to the bottom of slip buckets, glaze jars, and other containers. 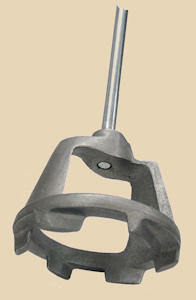 Side-by-side comparison of the heads of Hanson mixers. For perspective, they stand on the lid of a 5-gallon bucket. When it comes to chewing up settled solid material, those teeth on the bottom mean business! This 30" aluminum paddle is ligher and stronger than wood - easier to clean, too! The surface is sealed without chemicals to resist corrosion. Perfect for classrooms and studios.